This name derives from the Ancient Greek “Andréas (Ἀνδρέας)”, which in turn derives from “anḗr ‎(ἀνήρ) andrós ‎(ἀνδρός)”, meaning “man, adult male, husband”. In turn the name means “manly and strong, courageous and warrior”. He was the first Apostle in the New Testament. It is traditionally popular because, according to the Christian Bible, Saint Andrew was one of the earliest disciples of Jesus and one of the twelve Apostles. Andrew the Apostle (6 b.C.–60 a.C.), called in the Orthodox tradition Prōtoklētos, or the First-called, is a Christian Apostle and the brother of Saint Peter. The name “Andrew”, like other Greek names, appears to have been common among the Jews, Christians, and other Hellenized people of the region. 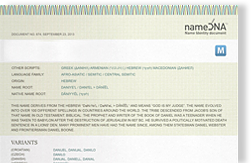 No Hebrew or Aramaic name is recorded for him. According to Orthodox tradition, the apostolic successor to Saint Andrew is Patriarch Bartholomew I.